When I first found out I was pregnant with my first child, I was in shock! My husband and I were not ready to become parents at all, for we were still in the process of pursuing our own goals and dreams. While my husband was trying to find a steady career he was passionate about, I was a college student with half of my degree yet to complete…we were both in trouble! My troubles didn’t stop there: my husband and I were living with my parents in a house with 10 other people including my 5 sisters, my brother and his wife along with their son, and oh yeah, she was also expecting her second child! In a house full of people and in a body full of stress, I PANICKED! This was not a part of our plan- we were supposed to be full-time working people, and moved into our own house before even thinking about having children!!! My first trimester of my pregnancy was the most difficult: I had EXTREME morning sickness; it was so bad that I could not even keep a sip of water down. Everyone around me kept telling me to eat crackers and to drink gingerale…but I threw those up too! And this MORNING sickness occurred throughout the day, no matter what time of day and no matter what I ate. The most difficult part was going to my college classes and concealing my pregnancy from my classmates and professors. I remember practicing for a group presentation for one of my classes with my group members, and throwing up right in the middle of our practice…it was so embarrassing! One of the girl’s in my group asked if I was okay, and that’s when I told her about my pregnancy; she was the only one that ever knew at school. As soon as my college semester was over my family and I traveled to Pakistan for my sister’s wedding. By this time, I was well into my second trimester and my emotions were flying all over the place! To make things much worse, I knew after my sister’s marriage ceremony she would not come back with us to Canada, but instead she was to move to France. Yes France. Where her husband lived. Far away from us. Far away from me. I cried at the very thought, for we were extremely close with each other. Whenever I had any issues with the world she was my ear, my shoulder, and my rationale…and now who was I to turn to in order to vent out my frustrations? 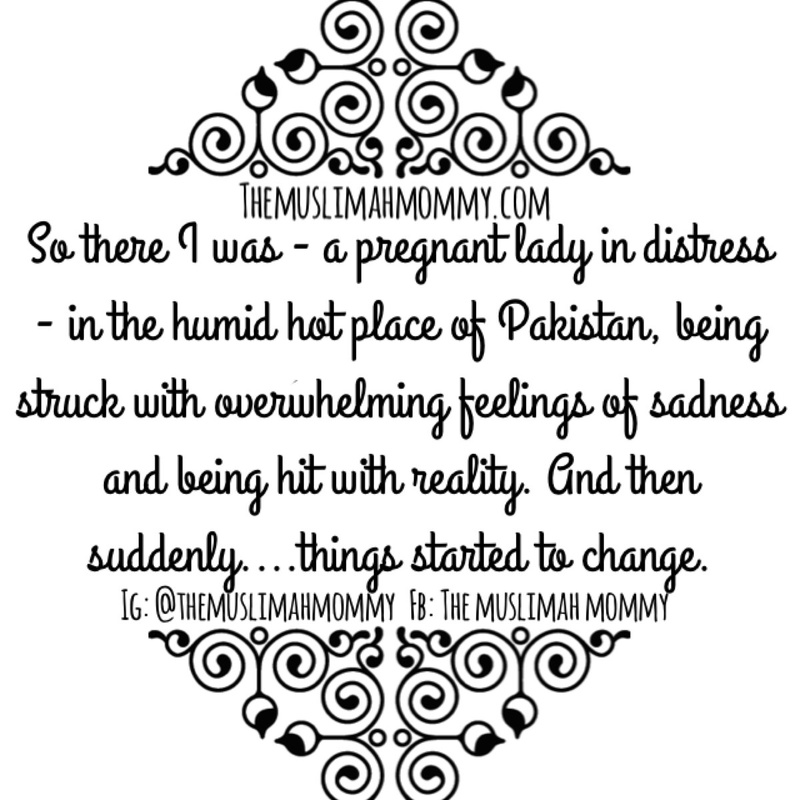 So there I was – a pregnant lady in distress – in the humid hot place of Pakistan, being struck with overwhelming feelings of sadness and being hit with reality. And then suddenly….things started to change. Still in Pakistan, I decided to check my application status for a university program I applied to. Although I was satisfied with my current studies in college, I wanted to transfer to university in order to experience a wide range of courses that were not offered at my college. As soon as read that I had been accepted to my program of choice, my heart filled with so much delight! I could not believe it! I just couldn’t contain my excitement! I had worked SO hard to see these words on the computer screen, ‘Congratulations, you have been accepted…” Eeeeek! But wait…I was pregnant! How could I forget that I was pregnant?! Would I be able to attend university while playing the role of mother to a newborn! That’s when I panicked! I panicked at the thought of attending a new school – a much bigger campus with new professors and no friends ALL THE WHILE BEING A YOUNG NEW MOM! Now back in Canada, I made the decision to attend the university program after taking the Fall semester off in order to have my baby. I also decided to contact the university, and ask them if I could join the student campus tour for new students, to ease my fears of course. No. They said no. Wait, what? They said NO to a pregnant lady in her third trimester?! Yup…and I was not too pleased with that answer. The reason for the decline was that the group tour for students had already taken place, and I had missed it while I was in Pakistan. However, the receptionist on the phone did tell me she could arrange someone to give me a one-on-tour within the next few days. A few days later, the holy month of Ramadan had arrived, and I made the decision to fast while pregnant. Initially I hesitated, however after talking to my relatives and my family doctor, I felt comfortable with the idea of fasting while pregnant. A few days into Ramadan, I finally had the chance to go on my university tour. Although I was fasting and pregnant, I really wanted to make sure I knew my way around university and comfortable with the campus, and I told my guide to show me ALL the libraries and buildings within the campus; that was BEFORE I knew the campus was so large and so spread out! After hours of walking, the tour was finally over, and my poor swollen feet were almost bursting out of my runners! At this time I was 33 weeks pregnant and so done! Wonderful experience! I can’t imagine how hard you faced your life that time.